the Italian Sibma Navale yard celebrates 55 years of activity! 1962-2017. Sibma Navale Italiana, located in Dolcedo, a town in the Ligurian interior near Imperia, is celebrating two birthdays. 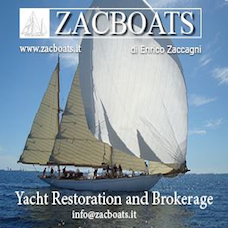 Founded by Ernesto Quaranta in 1962, the well-known yard specialized in building and restoring wooden boats celebrates its 55th birthday, the same number of years as Ernesto’s son Mario, the yard’s present owner. As well as building Armstrong classic motor yachts and restoring vintage yachts, Sibma Navale is also the leader in restoring and maintaining Dragon class sailboats. 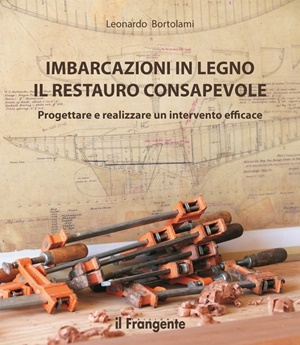 Today, alongside Mario Quaranta, the third generation is already at work. 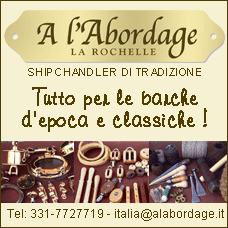 His young son Andrea, a sailor like his father, is working at full swing in the family yard. 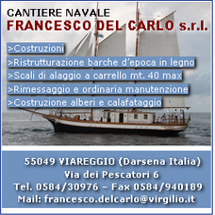 An anniversary as an objective, a confirmation of the yard as one of the most important historic shipyards in the international panorama. Founded in Turin in 1962 by the engineer Ernesto Quaranta, in 2017 Sibma Navale Italiana celebrates their 55th year of activity. That’s also the age of Mario Quaranta, present owner and an engineer like his father. The family business began the year of Mario’s birth in Turin, almost as if his parents had decided to give him a special present: a shipyard. Through the years Sibma Navale became famous thanks to the construction and sales of Promenade, EM7 and EM850 class sailboats. Kit sales of these chined, plywood sailboats helped diffuse the pleasure of sailing to entire generations. While continuing their construction of wooden dinghies and classic trawler style Armstrong motor yachts, thanks to an agreement with Petticrows Ltd., for more than 10 years Sibma Navale has been the international support yard for the European Dragon fleet, carrying out maintenance, wintering, restorations and direct assistance. The Dragon is an 8.9 meter one-design sloop, designed in 1929 by Johan Anker. More than 6,300 have been built, making the Dragon the largest one-design keelboat in the world. 70 Dragons have been rated in Italy since its launch. It is often heard, when speaking of one-designs, that “the problem with one-design racing is that usually the best sailor wins”. At Sibma Navale fifteen Dragons pass through the yard every year and the yard’s shipwrights have worked on more then fifty Dragons all told. Recently work was done on the Dragon Corail, built by the Swiss Wirtz yard in 1967. With mahogany planking over ash frames and a teak deck, she will be racing in Liguria. Individual classic Dragons can differ considerably, even though they all weigh in at about 1,700 kilograms. Masts are in aluminum nowadays, and the true differences are to be found in their hardware and rigging, and whether or not they’ve had a “structural upgrade” to make them more competitive. Venilia was built by the Danish Børresen yard in 1956. She has always raced in Italy, primarily in the Tyrrhenian Sea. Discovered abandoned in a shed in 2016, she was examined by Mario Quaranta, purchased, and then taken to the yard for a complete restoration. All the 16mm mahogany planking and more than 30 ash frames have already been replaced. Fastening was done with epoxy resin, stainless steel screws and copper rivets. Venilia will also be given back her original painted deck of marine grade mahogany plywood, covered with canvas and then the no-skid treatment. Her rig will be in top racing condition. To compete at the highest level in any weather her hull will be stiffened, in full compliance with class rules. This Dragon, to be relaunched this summer, will embody all the concentrated experience in Dragons of Sibma Navale. Towards the end of 2015, a Ligurian owner acquired the Bimini Kid in New York. She is a Bertram 31’, built in fiberglass in 1974 by the world famous yard of the same name. Unanimously considered one of the world’s most beautiful fisherman designs, she has already arrived at the Sibma Navale yard for a complete restoration. This will include all the interior and exterior, the cockpit, engines and wiring. The windows between the deck and the flybridge were completely remade in mahogany super-laminate. Bimini Kid will be relaunched before the end of the year. As an historic yacht, she could easily participate in a series of events dedicated to historic American yachts. Sibma Navale was chosen to design and restore the Baltic. A 27 meter long steel tugboat with a displacement of 180 tons and a 3.1 meter draft, the Baltic was built in 1963 by the Norwegian Westermoen Batbyggeri & Mek Mandal shipyard for the Standard Oil Company. The ex-tugboat’s reconversion began in 2014, in a French yard in La Ciotat, with the substitution of 30% of the 10mm hull plating, the creation of new interior compartments, new fuel tanks for a total volume of 24,000 liters, new ballast, and two new 800hp MAN diesel engines. The twin motors will give her a top speed of ten knots with an estimated fuel consumption of 60 liters/hour. Fresh water tanks will hold 8,000 liters, the grey water tanks 2,500 liters. The watermaker will be able to produce 360 liters/hour of drinking water. Her ample interior space will allow for four double berth cabins, a four berth cabin, the skipper’s cabin and another cabin for two crew members. Once the structural work is completed, Baltic will be brought to Imperia where the carpenter’s work will begin on her interiors. Armstrong motoryachts are the pride of Sibma Navale. This series of mahogany laminate vessels is ideal for those who desire seaworthy and comfortable classic yachts, so comfortable in fact that you could almost call them houseboats. The yard has completed one 7.5 meter Armstrong, four 10 meters, and two 12.5 meters. Construction of the Armstrong 13.5 meter, the series flagship, was recently completed and she will be sailing this summer. The Armstrong 13.5 is characterized by a windowed twin deckhouse, ample stern cockpit, interior helm and controls, a spacious sun bathing area forward and the ladder to the flybridge that transforms into a bathing ladder on the port side.